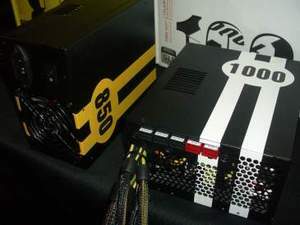 Everyone knows the Antec P180 is a massively popular product, but for those who wanted one but thought it was too big how about a new "mini-180"? It only supports the microATX form factor, but it's absolutely jam packed with features like support for three 120mm fans, two in the front and one rear, and a 200mm low noise/RPM included in the roof. The two in the front can only be used if the drive cages are completely removed though. Antec refused to make the case any longer, stating that it would just look too big and people shouldn't need the extra fans in the front but the option is there for those that need it anyway. It would have been better to offer some fans just to cool the hard drives in our opinion. 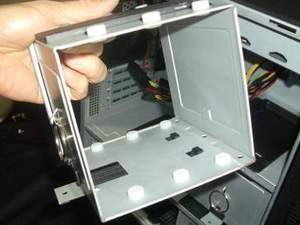 The whole case is entirely toolless, and there has been an incredible amount of thought put into the design, like eSATA instead of Firewire in the front, modular hard drive bays with hard wearing silicon grommets to reduce vibrations and also some very thick three layer panels for very effective sound deadening. 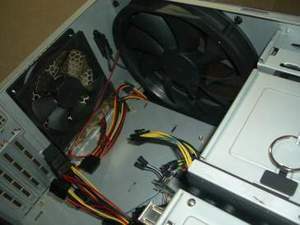 In addition every input fan has an easily removable filter where you don't have to take your case apart to get to them. The whole case feels very solid and looks well built, and although not everyone is a fan of doors, this one does swing back 270 degrees to stop you accidentally taking it off. It's aimed a people who want smaller, quieter PCs, but want the option of retaining plenty of cooling for a high end graphics card and CPU. 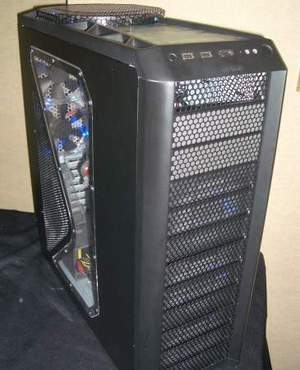 The Antec 1200 is a new case set to follow on from the 900. There will be two models, one with integrated watercooling and one without, although in what capacity the watercooling will arrive has yet to be decided since the model shown was a very early sample. It has a huge twelve bays so this puts it in Cooler Master Stacker territory, but it's still far smaller, and this includes three 120mm in the front, two 120mm in the rear and a 200mm in the top. 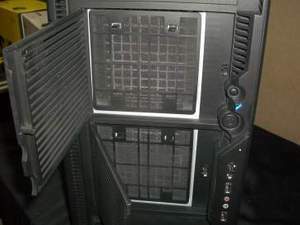 There's an extra space for another 120mm on the side and an adjustable one behind the hard drive cages. All of these include filters that you don't have to take your case apart to clean, just like the mini-180 and the entire case is again, tool less. The camo stuff on the top is also subject to change/removal, and the guys at Antec are certainly open to suggestions so voice your love/hate for the design in the forums. The included watercooling radiator in the roof is a custom one for a 200mm fan, although I stressed that they needed to simply include threaded holes for the watercooling enthusiasts, as they were likely to use their own high/low flow equipment. After chatting about it in depth, it looks like a possibility, but it ultimately depends on the compatibility and cost of their tooling process. The 1200 is due to begin being finalised and manufactured in July, so expect it sometime September to October. No retail pricing is known yet, although obviously the watercooling model will come at a premium. On the PSU front, Antec has its own 850W "Quadro" arriving as soon as next week for £125-130. The external design is really very groovy, despite the trend of car themed PC accessories = tacky, this really doesn't fit that bill. It has four 12V rails (hence the name, Quadro), two 6+2-pin and two 6-pin PCI-Express cables, 4- and 8-pin 12V and a 20+4-pin ATX cable. They are modular, with the PCI-Express sockets differentiated from the molex/SATA hard drive ones by being red and black respectively. The 1000W model will arrive a little later and has a very similar design, outside and in. Antec was keen to point out that the 850W model has 80PLUS certification and the 1000W's certification is currently pending. There's a single 80mm fan for both, which I was worried about at first but Antec assured me that it was quiet yet cooled efficiently due to the internal layout. 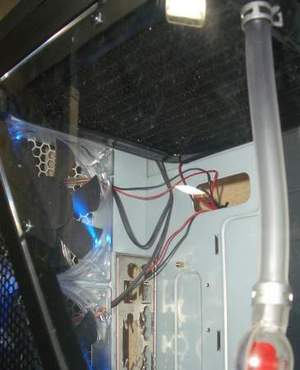 bit-tech was told that large fans over the top that many other manufacturers use don't cool the entire area efficiently as the air gets pushed down and straight out the back of the case. We still aren't convinced as we've seen it work just fine, and just like the rest of the PSUs we've tested, they'll get a full, load tested workout in due course. What do you think of the new cases and PSU designs? Let us know in the forums.